Years ago, I read a story told by a missionary ministering in an Eskimo village in Canada’s high Arctic in what was then called the Northwest Territories. While on a hunting trip, one of the Eskimo men came across a young female wolf pup and brought it back to the village. The other dogs in town immediately recognized it was different and terrorized the poor animal. But the villagers fed the wolf and it grew into adulthood. A full-grown arctic wolf can reach a height of five feet and weigh upwards of a 175 pounds. The now full-grown female wolf was a powerful animal, head and shoulders above any dog in the village. It could kill most dogs in a heart beat, but the wolf never grasped who it really was. Despite its massive size, the dogs in the village were still terrorizing the wolf. The missionary remembers one day watching the wolf being chased, tail between its legs, down a street by a yappy little house dog. A few days later, one of the men from the village took the wolf out to the tundra and shot it. It was a sad end to such a majestic animal. But the villagers were fearful one day it would wake up and understand who it really was. At that moment, everything would change and no one would be safe. We will never know what thoughts, if any, flashed through the young wolf’s mind. Were its instincts yelling out “you are a wolf” or was there just silence as it allowed its reality to be defined by a little lap dog? 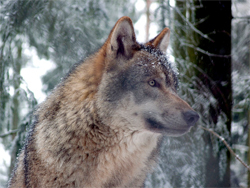 Many Christians are no different from this wolf. On one hand, there is the reality of who we are in Christ, but on the other we live in a surreal world coloured by unbelief and wrong perceptions. But for most, these are just words on paper. This collection of words must be embedded in our spirits and our mind. We have to start believing what the Bible says about us. Powerful post! We need to understand exactly who we are – children of the Most High God. If we really understood that, wouldn’t we live our lives differently? We might have less fear and doubt and more boldness. May we spend time in the Word of God learning who we are and what kind of empowerment the Holy Spirit provides us so we can live the lives He created us to live. Blessings! Thanks very much for your comment Shelly. Until we grasp who we really are in God, we can not accomplish what God has called us to do. Love this, Dean. So many of us loose site of this in our day to day living turning life into a struggle. We need to focus on these facts to continually unfold a greater sense of ourselves and who we were created to be. It so true. The battle is for the mind — how we think. Previous PostDid a remake of Alfred Hitchcock’s 1963 horror flick, ‘The Birds’, descend on the Vatican?